India is land of tradition of festivals celebrated with pomp and gaiety, each festival and region with its own distinctive repertoire of mouth-watering sweets. 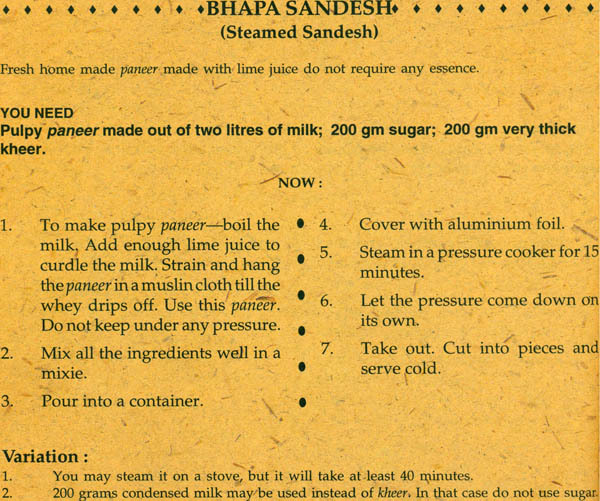 The Book of Indian Sweets is specially meant for those who think India sweets are difficult to Prepare at home. Culinary expert Satarupa Banerjee includes more than a hundred easy-to –follow recipes from all over the country, from delectable rosogollas and malpoas from the east and jalebis and gajjar ka halwa from the north to scrumptious puran poli and sheer khurma from the west and pal payasam and pongal from the south. The author has successfully blended flavours from the four corners of the country to tempt your sweet tooth along with encouraging you to exercise your own culinary skills. Fully illustrated with colour photographs, this book is a must for the homemaker. Satarupa Banerjee was born on 20 December 1946. She is an ardent collector of recipes, with her journalist-husband accusing her of thriving on a staple diet of cookery books. In her own words, "mine is a classic example of a hobby turning into a profession that is now a passion." She also conducts cookery classes at home. Her other interests include casts, books and wool-switch embroidery. Indians are too fond of sweets. Any good news, be that of a promotion in office, the fixing up of a daughter's marriage or the examination result of a child, is invariably heralded with a box of sweets or a tin of rasgullas. Our favourite expression is, aao, much meetha karo-come, sweeten your mouth. And, I say, why not? We have an astoundingly variety of sweets ranging from the ice cream like kulfi and delectable feathery feni in North of the numerous payasams of the South, the slightly westernised cakes of Goa and paneer based Sweets of Eastern India. As people from other lands came and settled down in our country – the Mughals, the Portugese, the British and others-their cuisine left the stamps on ours. Hence we find Goan cuisine enriched by that of Portugal while the Parsis brought with them a whiff of Iran. The Mugals made India their home and we thus have an aromatic culinary tradition. So with the Britishers. We tend to forget that the puddings and cakes that form our daily fare are actually foreign stuff. Now, you can make these sweets easily at home. If you feel the amount of ghee is excessive in some sweets, you can easily reduce the quantity in some cases and in others like the mysore pak, the extra ghee is drained out, anyway. I do not think a few words on Bengali sweets, particularly from Eastern India, will be out of place. Bengali sweets need no introduction really, they are famous all over India. What makes Bengali sweets so popular? 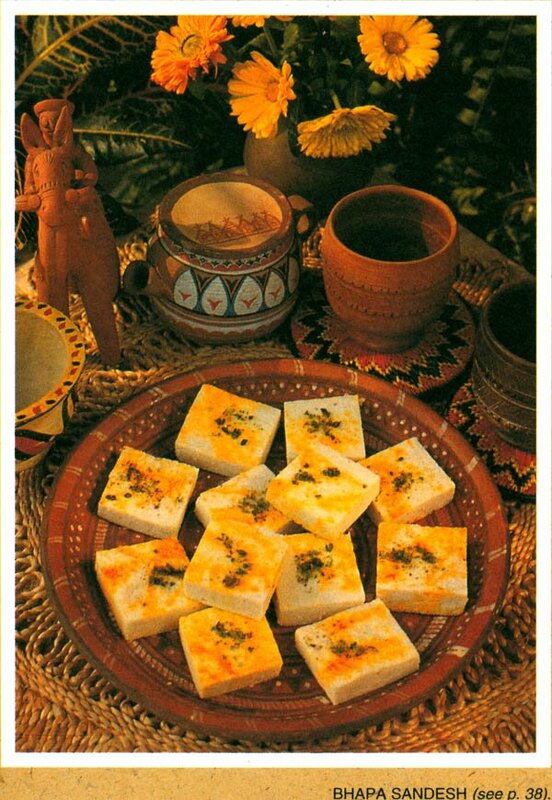 The traditional and better known ones are made of fresh paneer or cottage cheese. Artificial colours and flavours are hardly used and they do not taste excessively sweet. These factors makes the sweets nutritious and easily digestable. The most widely sold Bengali sweet is of course, rosogolla, followed by cham cham, kheer mohan, rajbhog, chanar jilipi,pantua, amongst others. Somehow, one cannot get good quality sandesh, the acme of Bengali sweets, outside Bengal. But the scope of sandesh is endless. It can be made in over100 different flavours and textures. The winter piece de resistance being notun gurer karapak (hard sandesh made of palm jiggery). It can last for weeks without losing its shape or flavour. One could wax eloquent and write pages on sandesh. However, that is beyond the scope of the book. Apart from sweets readily available in the market, certain dishes are prepared at home. These are home delicacies and I have included a number of these in this book. Once you have mastered the techniques of making the delicious payesh (kheer) and pithes (sweets made of jiggery, rice flour or ordinary flour and coconut), would hardly need to go to a sweet shop. They are actually quite easy to prepare also, as you will find out for yourself.